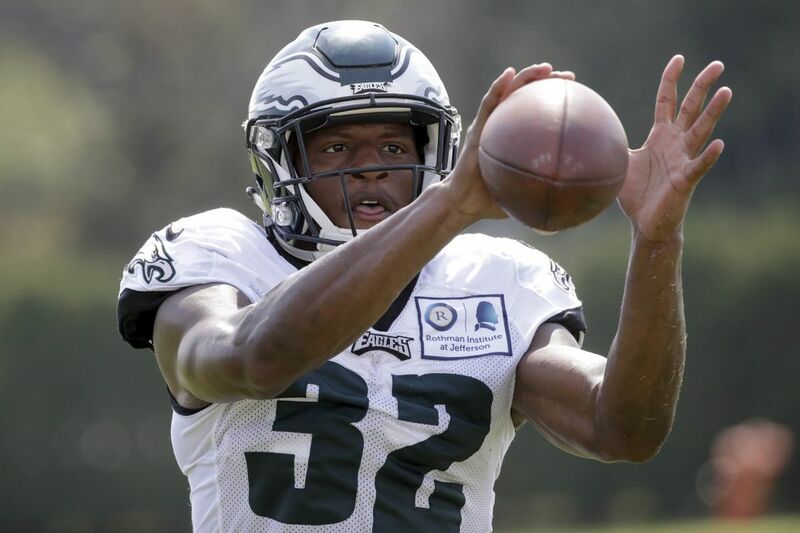 Philadelphia Eagles cornerback Rasul Douglas catches a ball during an NFL football training camp in Philadelphia on Wednesday. The Eagles' hopes of developing a rookie cornerback this season are on third-round pick Rasul Douglas, who seemed to have a pathway to starting with a strong summer. Defensive coordinator Jim Schwartz has not yet seen enough to trust Douglas. "Inconsistent," Schwartz said. "I'm sure he would tell you the same way. He's not only trying to learn all the nuances of the scheme, he's trying to be consistent with technique. Sometimes I think it feels like every time he gets like a finger in the dike, so to speak, another leak pops somewhere else, and that's what happens with rookies. I think somewhere along the line for Rasul, the game will slow down a little bit." Schwartz said that in the rookie minicamp, Douglas impressed the coaches. He was confident and competitive. However, the Eagles didn't have their defense installed yet. The more that was added for Douglas, the less confident he appeared. That's to be expected from a third-round pick, but hopes were high because the Eagles need help at the position. The opportunity remains, but the Eagles are still waiting. "It's got to get to the point where you know the scheme so well that now the game slows down for you," Schwartz said. "I think it's a well-used idiom or whatever it is, but there's a reason for it, and because the game does slow down for guys. Rasul is not there yet." The Eagles had a few other notable players return to practice in addition to wide receiver Alshon Jeffery. Linebacker Mychal Kendricks (quadriceps) and running back Donnel Pumphrey (hamstring) were both back on the field. Kendricks missed two practices. Pumphrey missed a week. Defensive end Chris Long also practiced after getting a rest day Friday. Quarterback Nick Foles (elbow), wide receiver Paul Groin (shoulder), guard Josh Andrews (hand), and tight end Adam Zaruba (concussion) all remained out. The Eagles' second open practice drew an announced attendance of 36,000 fans Sunday. The two practices this year drew a combined 59,000. In two practices last season, the Eagles drew 35,665.